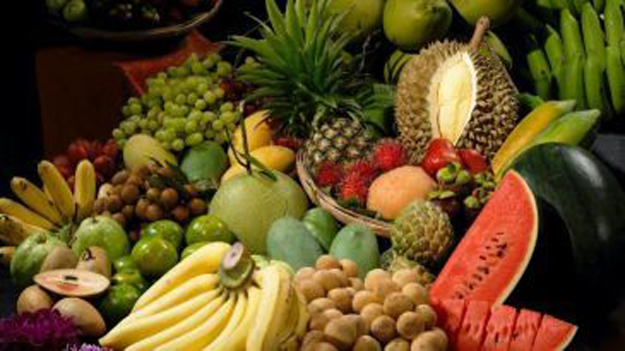 Back in early 2010, I was asked what I thought about being part of an event that highlighted the fruit-based diet, a diet I personally had been eating for about 20 years. It would be an event that would bring together the leading raw food educators with those interested in finding out more about this healthier way of eating and living, along with those from around the world who are already eating this way. Naturally, I thought this was a wonderful idea, and in August of 2011 that is exactly what happened. Held in Woodstock, New York, the first ever Woodstock Fruit Festival was born. And it was an immediate hit. As one of the pioneers of healthful living, imagine the fun I had being able to give lectures to a roomful of eager-to-learn and like-minded people, and to be able to socialize with them for more than a week! The festival quickly outgrew its original home, and relocated to the Lake George area of New York for the 2012 event. Its new location at Camp Walden suited this group of outside-the-box people perfectly. 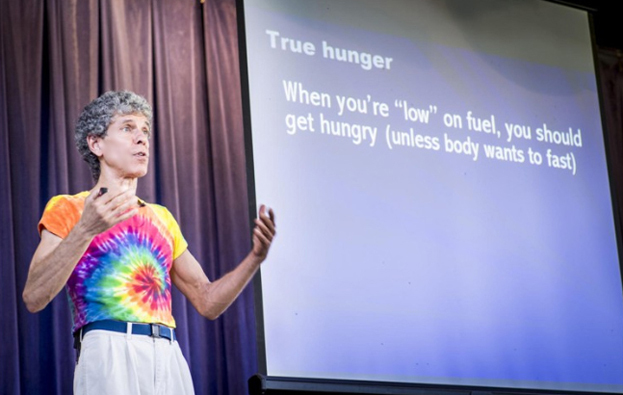 In a beautiful lakeside setting, 350 folks from around the world came to learn and have fun along with more than a dozen of the world's leading raw food diet advocates. And to say a good time was had by all would be an understatement. For me, giving close to a dozen presentations was a lot to do, but it was also the most fun I'd had in a long time. 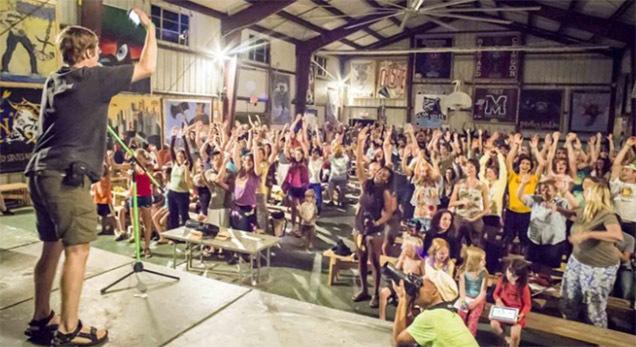 Evidently I wasn't the only one who enjoyed himself, because the word got out, and by 2013 the attendance had doubled again, with Camp Walden hosting a capacity crowd of delightful, fun-loving fruit-eating folks; the positive energy was everywhere you went! With new presentations to take in and more things to do for fun, the event just keeps getting better. And so does Camp Walden, who made major improvements to things like the dining hall in order to better accommodate an affair full of fruit eaters. At what other event would you see a sign that said, "This line for durian only". And whatever you were in the mood for, it was there. The 2013 festival once again featured bountiful food with all the fruit you could want, and awesome raw meals courtesy of raw food chefs Chris Kendall, Megan McDonnell, and Alicia Ojeda. And there were plentiful presentations by 20 of today's leading promoters of the raw, fruit-centered diet, so there was no shortage of empowering and thought-provoking information. Rounding out the event were exercise classes of every kind, morning meditation, sporting events, live music, entertainment from both professional performers and from the attendees themselves at a delightful talent show, plus hiking, lake swimming, yoga, rock wall climbing, support groups, children's activities, dance classes, mountain biking, and a mud pit! As part of my researching health issues over the last 45 years, I've attended many health related events, and with a few notable exceptions, most felt like an event for the sake of an event. The Woodstock Fruit Festival however is an event for the sake of the people attending; an event done "for all the right reasons". 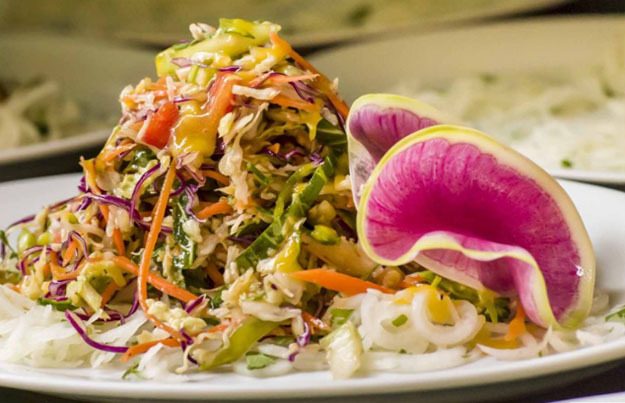 This annual festival exists to bring together people who want to eat a raw plant-based diet. It offers an opportunity for people around the world who are following a high fruit raw diet to meet in the real world and share their dreams, aspirations, and camaraderie, and at the same time providing a supportive and inspirational learning environment for those wanting to successfully embrace the healthiest of diets so they can live to their health and longevity potentials. In an age filled with health events promoting the importance of eating raw chocolate and of wearing healing crystals around your neck that are nothing more than a rock in a nice looking bag, an event like the Woodstock Fruit Festival was sorely needed. It not only represents reality, but brings some much needed sanity to the issue of health restoration and maintenance. With an increasing number of health educators promoting the notion that we must eat cooked food to be healthy, raising the global awareness of the environmental and health potential of a raw fruit-based diet is needed now more than ever, so the time has come for an annual event like the Woodstock Fruit Festival. Don Bennett is a Disease Avoidance Specialist, Health Creation Counselor, author, and the founder of Health101.org. For over 20 years Don has been thriving on an all-raw fruit-based dietary lifestyle program, the Fruit-based Diet+. This program includes enough fruit, nutrients, exercise, sunshine, sleep, and relaxation. He is currently based in South Florida, USA.